Lovely house. Charming town (Oxford). Only complaint is that there was very little room in the kitchen for a renter to put things because it was filled with owners' belongings. We had to pile food on the counters. ESVR was great- the rental process could not have been easier. We had a fabulous time in Oxford & thoroughly loved the Pride & Joy cottage. If possible, we'd love to come back next year. I got to visit the Mystery Loves Company shop but didn't get to the museum. We also enjoyed the Pope Tavern & Scottish Highland Creamery... on more than one occasion! Neighbors were warm & friendly. We were happy to meet so many other dog lovers. The cottage was charming & impeccably clean. We needed customer service once & they responded quickly & efficiently. A PERFECT vacation. As far as recommending it to others... I'm not sure because I want to keep this my little secret :-) I'm kidding. I'd recommend this trip to anyone! House was clean, well-appointed, and in a very quiet little neighborhood. Great choice for families with small children, as the folks that own this house have a few - several baby gates available, as well as lots of child-friendly plates/cups/silverware, booster seat, etc. Bunk beds have a nice high rail, and I felt comfortable with my 3 and 5 year olds sleeping up there. The TV turned right on to Disney Junior, and my kids had a blast taking a ride around the block in the wagon that was in the yard. Recommend the owners put black-out curtains in the bedroom with the bunk beds though! We had a great time in Oxford over the 4th of July weekend. The accommodations were very nice and comfortable and the weather cooperated. We hope to return next year. Our only recommendation on the house in that the WiFi was a bit spotty, but other then that, it was great! This cottage in the village of Oxford has been a favorite place for us to get away in the early spring for years. This house is our choice! Great little town on the Tred Avon River to walk the dog, outstanding seafood restaurants and best of all ESVR is great to deal with! Cottage was wonderful and very well accommodated, although there is only one television. I would suggest that the owners add at least one more to a bed room. Oxford is a very tiny town and with just a convenience store and a few pubs but it is surrounded by water in three directions. My only negative about the stay was: we had intended to do some Christmas cooking baking and there was no electric mixer. We would have brought our own but the management company suggested one was available--it wasn't. This was small compared to the quality of the house. We would definitely stay there again. We had a wonderful weekend in Oxford! The house was in immaculate condition, and it was so charming and very well-appointed. We loved that we could walk across the street to the Oxford Inn for dinner and drinks. We enjoyed every minute of our time at Pride and Joy Cottage. Thank you! This is a lovely cottage. Cozy, very tastefully decorated, convenient. Highly recommend! We were delighted with the ambience of the cottage. Every room was immaculate and well appointed, cheerfully and seemingly professionally decorated with colorful walls, comfortable furniture, good lighting, and well appointed kitchen and bathrooms. We especially enjoyed discovering all the crab decorations - on the walls, the dishes in the kitchen, and even on one of the shower curtains. We were 4 people (sisters) and the bedrooms were comfortable, even the room with the bunk beds. We loved the porch and sat out there one night enjoying a thunderstorm from the cozy rocking chairs. The kitchen was well stocked and immaculate. We enjoyed the living room, the dining room and the kitchen for meals and chatting. The location was right in town and we rode our rented bikes everywhere. I would recommend this cottage to anyone who appreciates cozy ambience, professional decorating, and easy access to everything in Oxford. The Eastern Shore Rental staff was accommodating and professional. Oxford is a quaint historical town worth visiting. The home was adorable. Very comfortable and within walking distance of the park and local market.Loved the screened in porch. The surrounding area was peaceful and everyone was friendly. Will definitely return! We thoroughly enjoyed our getaway to Oxford! Our cottage was charming, everything we needed. We even overcame the Wifi not working for the weekend, thank goodness for hotspots on our phones. The house has lovely decor, location is perfect for walking and really comfy beds. Two suggestions: bathtubs are slippery, need safety strips and the one TV is really small, maybe an upgrade is in order. Thinking about coming back in the Fall! The house is quite nice - spacious with a cute porch and yard, and comfortable furnishings. The location is great, very close to the water on Tred Avon and walking distance to the little market and Pope's Tavern. A prior renter mentioned the abundance of personal items in the home, including pictures. While there are such items, and an open owner's closet, we were left more with the feeling that someone opened their home to you, rather than a cold, never lived in rental. We did not think that the personal items were overbearing. I would definitely rent the home again. We had a lovely holiday at Pride and Joy cottage. We were very happy with the house and location. We had a bit of a hiccup upon check in where the management company office was not open and we were wondering how we would pick up our keys, but it was resolved quickly so was not an issue overall. Also, the TV has a bit of a trick to get it to have sound which we figured out fairly late in the week, so a specific note about that would have been helpful. Having a place where young children and dogs are welcome was perfect for us and we would definitely visit again. Great home in a quaint, wonderful town. Very clean and well appointed.Highly recommend. The cottage was lovely, clean and comfortable, and the town of Oxford was so peaceful. I thoroughly enjoyed my stay. It was great to be able to bring my dog along as well. Loved the front porch and proximity to town. One suggestion-The owners could perhaps remove more of their own personal items from the closets (strollers, child gates, etc)In addition, after shopping, there was no place to put provisions since the pantry cabinet was clearly marked "owners pantry" and was full of owner's things. So for the week the counters were cluttered with what I had bought. I have rented many homes but this was the 1st time there were so many personal items including photos of the owner's family- on the top of bureaues, etc., again limiting space. Between the items in the closets and kitchen as well as all the photos,I sort of felt I was being intrusive,rather than actually living in a "summer rental". Everything was above average and we cooked some wonderful meals! It would have been helpful to have access to spices and such as we do enjoy cooking. Rental staff were very helpful in clarifying how to use the TV and DVD player- need good written instructions! I also recommended that the screened porch could use a thorough cleaning to make it more enjoyable to use! The house and location were terrific! Very enjoyable family trip! The house was comfortable and met all our needs! We spent a week at the cottage, what a beautiful home. The area is very quiet, nothing much to do in the local town, there was no public beach or swimming in the town which meant day trips each day to find things to do but it was very relaxing and the neighbors are all very friendly. As there were six of us we prepared a number of meals at the house, the appliances were top notch with the exception of the ice maker not working in the fridge. The kitchen was pretty well equipped but lacked a number of items, eg. there was no muffin pan, no martini shaker, a must for our family. If I was to stay in Oxford again I would want to rent a house with a pool, the weather was very hot and sticky and a dip would have made all the difference. This is the fourth year that we have stayed at "The Pines" and we were, again, rewarded with a restful & pleasant visit. The new outdoor kitchen is a great addition this year.The house is clean, well equipped & comfortable. The management staff is friendly & responsive to any need. The location is close to St. Michaels (only minutes by car) and is quiet & peaceful. We've rented three other places in the area, but this is our favorite (as evidenced by our fourth consecutive year of renting). We'll be back! We had difficulty getting in trying to use coded lockbox-but after calling mgmt. # we used code on door-much simpler. Had a unique exp. watching the bay flood up over the dock. We LOVE this place, the new master is great & I love cooking in that kitchen. We will be back! We've come to the Pines property several times over the years, and have always loved our stays. This time was no different! The property is maintained VERY well, and the owners have spared no detail in making the house comfortable. We'll definitely be back! A great place to get away over the holidays with friends and family. 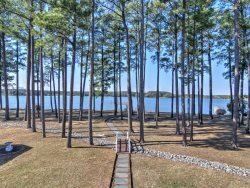 Beautiful water views and quiet area and only a 10 min drive to St. Michaels for shopping and retaurants. Rise Up java hut located right at the turn off road and Graul's proximity allows for nearby shopping needs. Great social spaces and well equipped kitchen. Only issue was the wireless network which was fixed by ESVR and then worked great. The only downside to this home is that we wish it had more bedrooms in relation to it's great social spaces. This home is a must if you like to try vacation homes on the Eastern Shore. Our 3rd year here! We'll be back. House has all the comforts & amenities you'd ever need. Great dock for my rental boat. Great pool. Only a few minor problems this year; Refrigerator smelled of fish & one of the easy chairs in living room had a fishy odor on the arms. Someone sat there after handling fish & didn't wash-up very well. Again, I suggest the owner replace the charcoal grill, the current grill has broken handles, a broken wheel and the legs are wobbly and the kettle is rusting out. The pool hand skimmer net was useless, it was ripped & torn and needed replacement. Also, the deer flies made it difficult to enjoy the lovely deck & poolside lounges. They weren't as bad this year as last year, but still bothersome. Bring bug spray! An electric can opener would be helpful. My wife has arthritic hands & couldn't use the manual opener. Aside from these minor things, the home was wonderful, the management staff were great and we will definitely be returning.